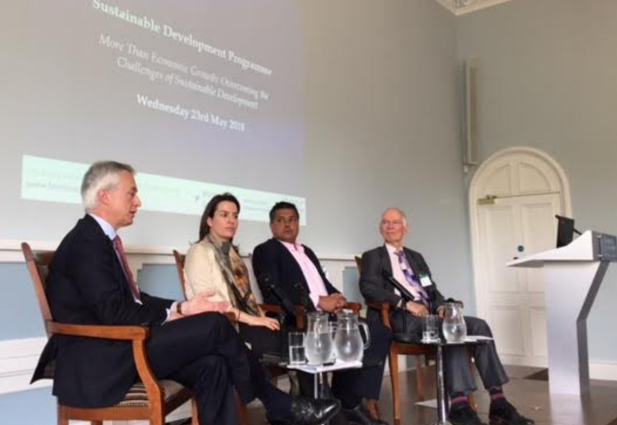 EAIF Executive Director, Emilio Cattaneo, joins distinguished panel at British Academy event on overcoming challenges to sustainable development. As part of its Sustainable Development Programme, the British Academy (BA), the UK’s premier social sciences and humanities institution, is running of series of events looking at the evolving geopolitical, financial and technological challenges and forces affecting the international development landscape. On 23rd of May, at the Academy’s London HQ, EAIF Executive Director, Emilio Cattaneo, took part in a panel considering the issues around creating access to affordable, reliable and sustainable energy in developing countries, chaired by Professor David Newbery of Cambridge University. Mr Cattaneo explained that the core mission of EAIF and all the companies of PIDG Ltd. is to increase access by the poorest communities in Africa to affordable infrastructure services, through enabling private sector infrastructure projects to be financed. Pointing out that “affordability” is hard to define, Mr Cattaneo said the low tariffs achieved on solar projects, such as through the World Bank’s “Scaling Solar” programme, are just one factor in ensuring that the benefits of lower costs reach those who really need them. He said all initiatives aiming to accelerate the availability of lower cost solar power have challenges, including sometimes raising expectations across the continent by the low tariffs achieved. “Institutions like EAIF need to work closely with host governments and with concessional debt and grant providers to ensure access is truly affordable,” said Mr Cattaneo. In response to a question from the audience, Mr Cattaneo suggested that although renewables are transforming the energy matrix in a number of African countries, there is still a need for fossil fuel plants, particularly in maintaining reliable 24-hour base load. He gave the example of Mali, which is developing solar and fossil fuel power stations. It has historically depended on large-scale hydro for base-load. In times of reduced rainfall and drought, hydro power needs to be backed-up by generating capacity that can reliably meet demand night and day. On the panel with Mr Cattaneo were Dr Alex Money from the University of Oxford and Ana Hajduka of Africa GreenCo. Dr Money runs the “Making Light Work” research study, with funding provided through the British Academy, which empirically evaluates the progress being made through Scaling Solar on specific country programmes. Founded in 1902, the British Academy is one of the world’s oldest institutes in the fields of the social sciences and the humanities. Its roll of distinguished Fellows include the economists J M Keynes and Friedrich Hayak, the philosophers Karl Popper and Isahia Berlin, anthropologists Louis and Mary Leakey and historian A J P Taylor.